Partly cloudy skies this morning. Thunderstorms likely during the afternoon. High 69F. Winds SW at 10 to 15 mph. Chance of rain 80%.. Rain likely. Low 44F. Winds NNE at 5 to 10 mph. Chance of rain 100%. Rainfall around a half an inch. LCSC student Morgan Crea (left) spent last week learning from radiology technicians Lauren Green (standing, right) and Kim Hunter (on table). GRANGEVILLE – Spring break wasn’t much of a break for Lewis-Clark State College student Morgan Crea. The 2018 Grangeville High School graduate spent most of her week March 25-29 at Syringa Hospital. 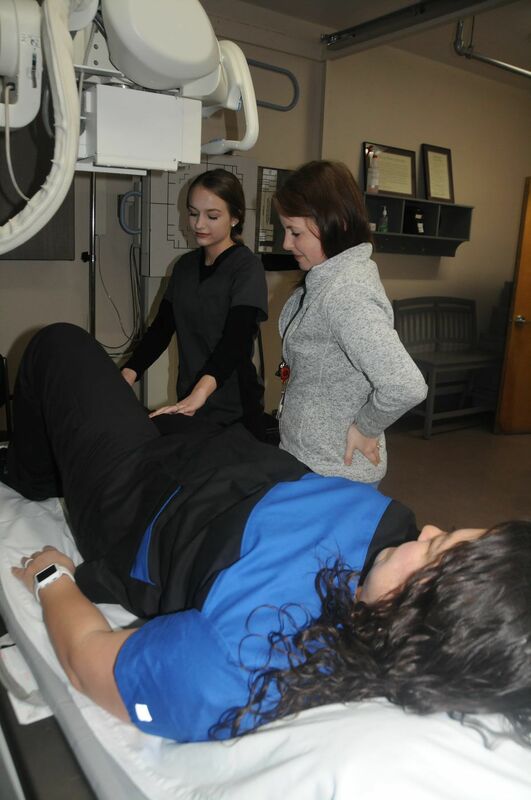 There, she job shadowed radiology technicians Kim Hunter and Lauren Green. “I’m trying to get in hours that I can put on my application for the radiographic science program,” Crea said. She is finishing up her first year of general requirements prior to applying to the program where she plans to learn to become a radiology technician. She is obtaining a four-year degree. Crea spent the week learning the different angles for varying x-rays for distinctive parts of the body. “I’ve also watched CT scans on patients, which involves injecting them with contrast in order to see the scans,” Crea explained. During the scans and x-rays, technicians have pointed out bones and explained what was happening on each of the scans and films. “It’s been super helpful to watch the interaction with patients, as well,” Crea added. Hunter said they get a couple of people a year who shadow. “We occasionally even have doctors who want to learn more about the whole process,” Green added. Crea is the daughter of Daryl Crea of Grangeville and Michelle Garber-Mabe of California and the granddaughter of John and Norma Crea of Grangeville.